Beautiful Day 3 panel artwork about 60 inches by 24 inches in size. Since the goal is to produce a finish artwork in a day, that normally takes two weeks, the push is to find style short cuts to save time and effort. Below are the last three years of Birthday Paintings. The shortcuts I used for these paintings was to use a Vincent Van Gogh master artwork as the color scheme. I then used quick, less structured brush strokes, to speed up putting down the paint. Still, all three of these years it was a struggle to complete the work in a day’s time. Then with last year’s painting I felt especially frustrated with this van gogh’es look, knowing that it had nothing to do with my current style. For the 2013 Birthday Painting, the Van Gogh look was out. I never even considered breaking with my current style. What made that decision easy was the reduction in the total length of the painting from six feet to five foot. That one foot difference, plus my advance construction of all the needed canvas, allowed me the extra time to paint in the same style that I was using for the current Vivaldi work. The day did go fast, and all the decision-making was swift, and there was a certain level of stress in the constant need to move it along, but in the end I finished the rough final by early evening. And the reason this plan worked was because all I had to do is look over at the fifteen foot, unfinished Vivaldi work, to know what moves were up next. My conclusion, after a several hours of clean up, is I do not think I could have done any better even if I had painted this work over a two-week period. This work not only strengthens and reinforces my current style it, in some ways, helps to mature my current look. 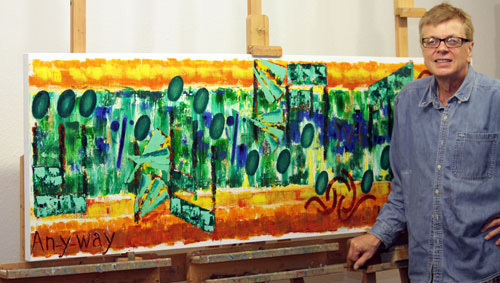 Now, we are moving on with another five foot, four panel artwork. Of course this painting will take two to three weeks to complete. What I am doing is to try to produce smaller paintings that I can charge a lot less for. I am thinking from $300 to $600 for another five foot or less artwork. The point is I have accumulated a wide stack of artwork that has not sold in the last two years and more. I have reach a point where it has become necessary to try something different. I may find that these smaller size works are the answer to how I can improve my sales. The light bulb came on when I meet Professor Buchholz in the U W Music Department to discuss where they thought Blue Rondo a La Turk could be hung. Although, by my standard this artwork , about 76 inches by 32 inches was small, the Professor kept walking and pointing to walls and spaces, telling me it would not fit any of them. Finally, we ended up in the large orchestra room. He, again pointed to this and that wall, explaining for each why the artwork would not fit. Finally he pointed to the last wall, a long-span of large windows. That is where he thought it would have to go for at less two years, until the finishing of the remodeling. My beautiful Blue Rondo, for now, will hang above the windows, ten off the ground where no one will know it is there unless they happen to look up, way up, yea way up there, yea that is an artwork, way up there. I said that would be OK, because the painting would be out of direct sun light, and because it would eventual be hung lower for viewing directly. What else could I have said. He said he had discussed Blue Rondo’s placement with the Art director, and that was the conclusion. He asked about how many hooks, and I said two. He said he would let me know. We shook hands and I left. That is the reason I have started to paint smaller, cheaper, and probably compromising artworks. That is if you think five feet is small enough, and that it is OK if I chop the musical phrase when needed, to make the music fit. Oh, no, I am back to the beginnings, making the music fit the canvas. At less, so far, I’m not vertically challenged. This is a requested work based on that eighties great love song Keep on Loving you by Reo Speedwagon. This constructed artwork consisting of four panels with the largest being 24 inches by 24 inches, and with a total length of five feet four inches. Oh well, I find it hard to set limits to my artwork. I will keep trying. You dreamer you.